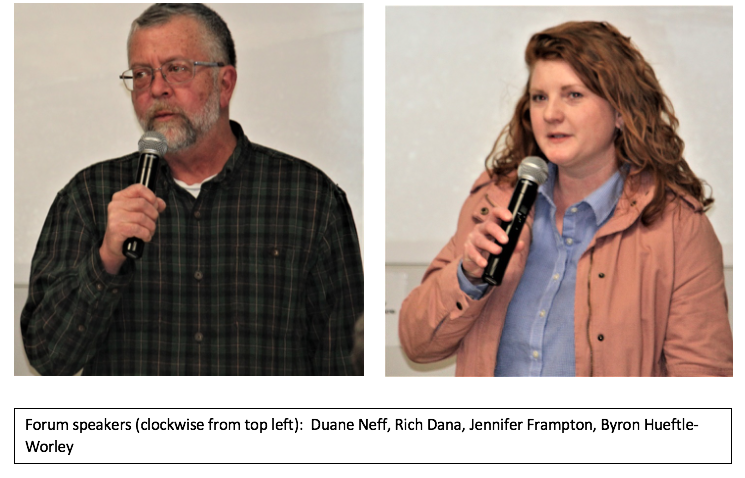 Grinnellians concerned about waste and recycling gained insights and received answers at a forum organized by the League of Women Voters Tuesday night at the Drake Community Library. The presentation, originally scheduled in February, was postponed due to weather. Terese Grant, President of Grinnell’s LWV, moderated the event. 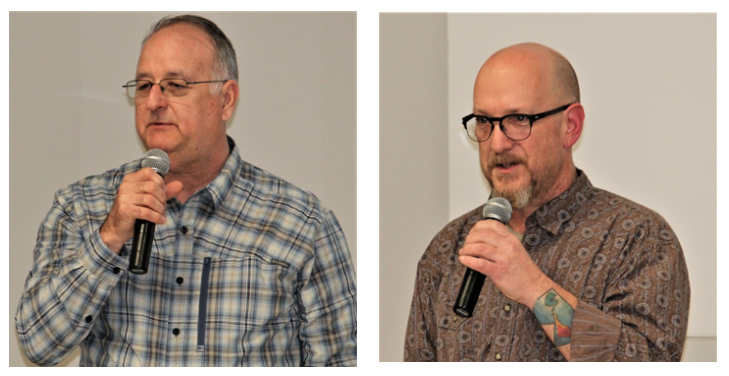 Participants were Duane Neff, Public Service Director of the City of Grinnell; Rich Dana, Executive Director of Imagine Grinnell; Byron Hueftle-Worley, City Council Representative at Large; and Jennifer Frampton, Program Coordinator of South Central Iowa Solid Waste Agency. The program began with each participant making introductory remark; general questions and comments from the audience followed. Neff updated attendees on the status of Grinnell’s conversion to automated solid waste pickup. A truck has been purchased, and containers are on order—specifically, 402 36-gallon bins; 2,150 63-gallon bins, and 459 95-gallon bins. About one month after automated solid waste pickup begins, curbside recycling will end. Residents may still take recyclable materials to the public works recycling site at 1411 First Avenue; there will be no change in the treatment of such materials once dropped off. Dana explained that the definition of what is or is not recyclable depends more on economics than on science. If there is no market for a so-called recyclable item, it is not—from a practical standpoint—recyclable. 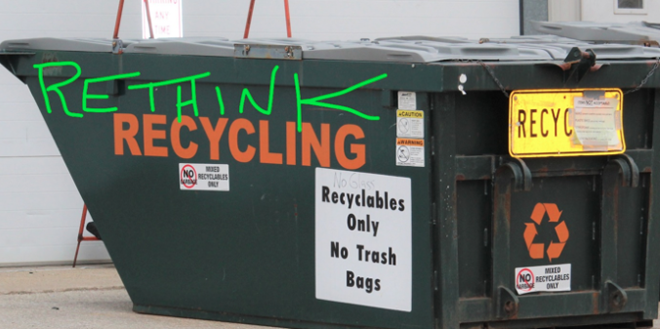 Imagine Grinnell wants to facilitate Grinnell’s conversion to automated solid waste pick-up and to help the city meet the challenges of recycling. Information will be forthcoming on the agency’s website. Dana reported a recent exchange between him and Russ Behrens, Grinnell City Manager, in which he asked Behrens what he would like to see as an ideal outcome in solid waste management and recycling efforts in Grinnell. Hueftle-Worley emphasized the value of Grinnell’s $13.5 million wastewater treatment plant. Food waste, he stated, makes up a significant portion of the solid waste that Grinnell sends to the landfill. If residents have a garbage disposal installed in their kitchens, food waste can be sent on its way through the disposal; the wastewater treatment plant is well equipped to deal with it, and eventually it can go to area farms as liquid compost. Established in 1994, SCISWA originally served the counties of Lucas, Marion, and Monroe; Poweshiek County joined in 2004, Frampton noted. The agency receives no tax dollars. All funding comes from disposal fees. The Iowa Department of Natural Resources regulates the agency, whose mission is the disposal of solid waste. Frampton’s initial remarks dealt with the issue of reduction versus recycling. She noted that the latter requires almost no change in habit—nothing more, perhaps, than tossing a soda can into a recycling bin rather than a trash receptacle. Reduction, on the other hand, can call for significant change of habit—drinking water from a fountain or faucet instead of that soda. After members of the panel had made opening remarks, the session was open to questions and comments from audience members. Several points of information resulted. When curbside recycling ends, the red bins can be used to transport recyclables to the Public Works Department. Plastic garbage cans may be recycled if labeled with an acceptable number (presently 1-7). No fees are planned for recycling from city residents. For people outside the city who use the recycling site, fees have been discussed but not yet established. Food waste accounts for 19.1% of materials going to SCISWA, according to a 2017 survey. That is the equivalent of 630 semi loads. Whenever possible, food waste should be sent through a garbage disposal. Although street construction is planned near the Public Works Department, access to the recycling site will be available throughout the process. Market declines have made recycling expensive. “You could make an argument that it would be cheaper to throw everything into solid waste,” said Duane Neff. Nonetheless, Grinnell wants to maintain a recycling program on a drop-off basis so that, if the market improves and recycling becomes more economically attractive, the process will be in place. As an example of market fluctuations, Duane Neff cited cardboard. Once, cardboard fetched up to $130 per ton. Gradually, however, the price fell to $25 per ton. The present per-ton price is $40. There are no plans at present for a city-wide composting program. Some cities have had good luck with such programs, but some have not. Colored wrapping paper used for presents is not recyclable. At the landfill, solid waste is deposited in cells that are lined to prevent contamination from leaching to soil and water. When cells are sealed, water and oxygen are prevented from entering; thus, very little decomposition occurs. “They don’t go away,” Jennifer Frampton advised, referring to cells at the landfill. She said that the SCISWA site should be operational for about 107 years. Considering paper versus plastic bags, plastic bags can be recycled but must be separated from other items. The cost of a plastic bag is about 1.5 cents, according to Byron Hueftle-Worley, whereas a paper bag of comparable size can cost the merchant about 15 cents. One can avoid the issue by taking reusable bags to stores. Chemicals may be taken to the SCISWA Poweshiek transfer station during normal operating hours in the months of April through September. The emphasis of the forum reflects changing times. We’ve become waste conscious and we’ve learned to recycle, but now another step is required: Reduce.